Sen. Jeff Flake announced on Friday morning that he will vote to confirm Judge Brett Kavanaugh to the Supreme Court - and faced immediate backlash from protesters and survivors of sexual violence. "You have power when so many women are powerless," one said. Sen. Jeff Flake announced on Friday morning that he will vote to confirm Brett Kavanaugh to the Supreme Court - and faced immediate backlash from protesters, some of them survivors of sexual violence. 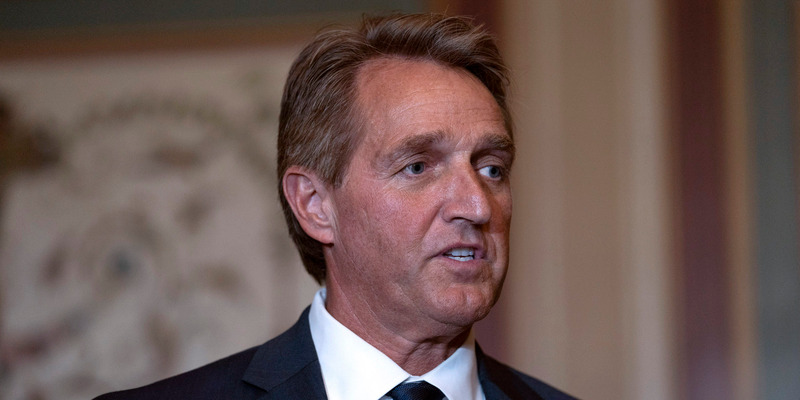 Minutes before the Senate Judiciary Committee met on Friday morning to conduct a committee vote on the nominee, Flake and an aide were cornered in a Senate elevator by female protesters. "I told the story of my sexual assault. I told it because I recognized the story that she is telling the truth. What you are doing is allowing someone who actually violating a woman to sit on the Supreme Court. This is not tolerable," one protester said. "I have two children. I cannot imagine that for the next 40 years they will have to have someone in the Supreme Court who has been accused of violating a young girl. What are you doing, sir?" Flake nodded and said he needed to get to the vote. "You're telling all women that they don't matter, that they should just stay quiet because if they tell you what happened to them you are going to ignore them," another protester said, close to tears. "That's what you're telling me when you vote for him. Don't look away from me." Another protester said, "You have power when so many women are powerless." WATCH - KAVANAUGH protesters hold open JEFF FLAKE's elevator on his way to the Senate Judiciary Committee.